A spectacular sunset is one of the many aspects of the park that cannot be storm damaged. The good news is that when you get to the beach you can walk all the way to Mexico if you wish. All beaches in Texas belong to the public. 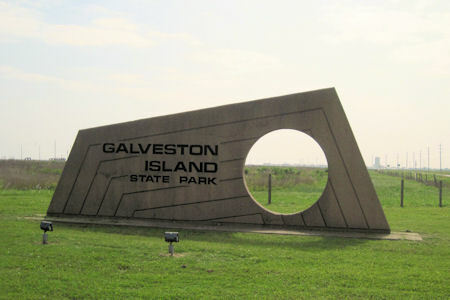 Galveston Island State Park is about 12 miles down island (southwest) from Galveston, Texas. The park covers the entire width of this Gulf of Mexico barrier island. The width of Galveston Island at this point is about 1.5 miles from the waters of the Gulf of Mexico to West Bay on the inland side of the island. The park has about 1.5 miles of beach front. Hurricane Ike hit Galveston Island on Friday, September 12th, 2008. Weeks later when the island was finally reopened an initial assessment of Galveston Island State Park was done and the damage was extensive. All the buildings except the nature center were destroyed and the landscape was covered with debris. The sand berm between the beach and the campground and day use area was gone and much of the beach had receded into the gulf. It was estimated that it would take 7 years before the park could reopen. The Friends of Galveston Island State Park and other volunteers thought that was just not acceptable. So they went to work cleaning up the debris and rebuilding the park. 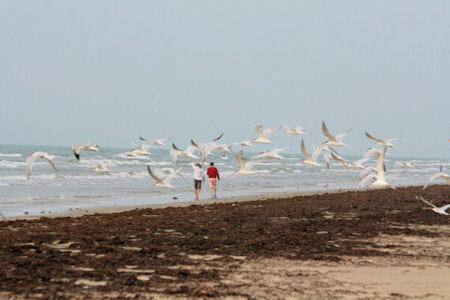 Galveston Island State Park, whose facilities were devastated by Hurricane Ike in September 2008, made a remarkable comeback and once again offered beachside camping in time for the busy 2008 Fourth of July weekend. And the work continues. 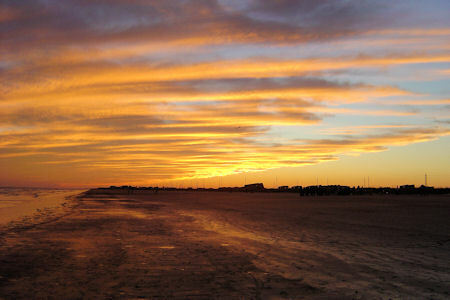 Currently, April 2011, The Park has 36 beachside campsites situated on three loops. (Before the storm it had 150 beachside campsites.) Two camping loops will accommodate tents or recreational vehicles and have restrooms and showers. The third camping loop is wired for 50 amp electric service and will be for RVs only. 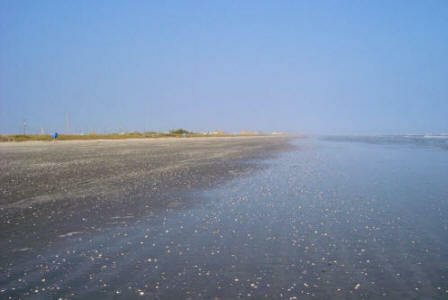 All beachside camping sites will provide foot traffic access to the Gulf of Mexico. The day use area, which is very popular, does not have any shelters for shade. While I was there volunteers were in the process of building structures to provide shade and picnic areas. The volunteers and park staff are slowly putting things back together. Because of the limited campsites, reservations should be made early. If you have any questions about the park and the current status of the work just call the park. If you are interested in volunteering contact the Friends of Galveston Island State Park. Mosquitoes can be a problem. Depending on the conditions and the time of year, mosquitoes can be a problem all day or only an hour or so before sundown and into the night. When they are only out at night, you can set your watch by their arrival. If you have a free standing satellite dish, make sure it is tied down. The wind blows strongly from the south most of the time. I usually visit in the winter. It can be very crowded in the summer. There are lot of things to do in Galveston, Texas other than go to the beach year around.